One way that the St. Johns River Water Management District (District) is working to protect Florida’s water resources is through its minimum flows and levels (MFLs) program. As a part of fulfilling its mission and statutory responsibilities, the district establishes MFLs for priority water bodies within its boundaries. MFLs define the limits at which further water withdrawals would be significantly harmful to the water resources or ecology of an area. MFLs are one of many effective tools used by the district to assist in making sound water management decisions and preventing significant adverse impacts due to water withdrawals. Hydrographs (Figure 2) depict the fluctuation of high and low water levels or flow in a typical stream or lake over a long time period. 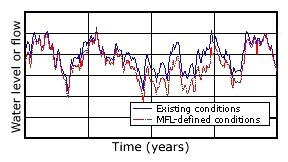 The upper line represents the existing hydrologic conditions and the lower line represents the hydrologic conditions defined by the MFLs. The hydrologic conditions defined by the MFLs are similar to, but are usually lower than, the existing hydrologic conditions. These two hydrographs can be summarized as the percentage of time each water level or flow is equaled or exceeded; known as a water level or flow duration curve (Figure 3). The area below the MFLs curve (salmon-colored shaded area in Figure 3) represents the water reserved for protection of fish and wildlife or public health and safety. When use of water resources shifts the water levels below that defined by the MFLs, significant ecological harm is expected to occur. The distance between the two curves (light blue shaded area in Figure 3) represents the water available for use that will not result in harm to the water resources. MFLs are established to define sustainable water use while protecting the water resources from significant harm caused by permitted water withdrawals. Establishing MFLs is a requirement of the state Legislature under Subsection 373.042(2), Florida Statutes (F.S.). In addition, establishing MFLs is required by the state Comprehensive Plan, the water resources implementation rule (formerly state water policy), and a 1996 governor’s executive order for priority water bodies. 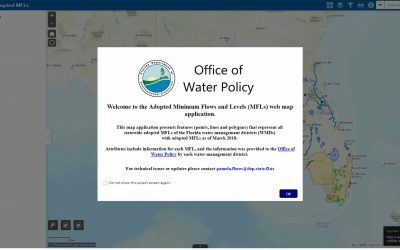 The St. Johns River Water Management District updates its MFLs priority list annually. The priority list is based on the importance of the waters to the state or region and the existence of or potential for significant harm caused by withdrawals to water resources or ecology. It includes waters that are experiencing or may be expected to experience adverse impacts because of existing or future water withdrawals. The MFLs program provides technical support to the district’s regional water supply planning process (section 373.709, F.S. ), and permitting criteria for the consumptive use permitting program (Chapter 40C-2, Florida Administrative Code [F.A.C.]) and the environmental resource permitting program. MFLs identify a range of water flows and/or levels above which water might be permitted for consumptive use. MFLs protect nonconsumptive uses of water, including recreation in and on the water, fish and wildlife habitats and the passage of fish, estuarine resources, transfer of detrital material, maintenance of freshwater storage and supply, aesthetic and scenic attributes, filtration and absorption of nutrients and other pollutants, sediment loads, water quality, and navigation. 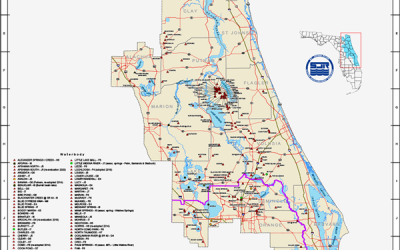 Florida law states that the district’s Governing Board “shall use the best information and methods available to establish limits which prevent significant harm to the water resources or ecology.” District MFLs are typically determined based on evaluations of topography, soils and vegetation data collected within plant communities and other pertinent information associated with the water resource. MFLs take into account the ability of wetlands and aquatic communities to adjust to changes in hydrologic conditions. 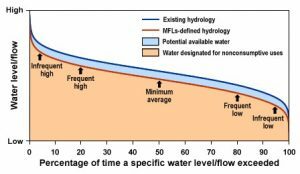 MFLs allow for an acceptable level of hydrologic change to occur. When use of water resources shifts the hydrologic conditions below levels defined by MFLs, significant ecological harm can occur. MFLs do not “drought-proof” a system or mitigate the impacts of climate change. MFLs are adopted as rules (Chapter 40C-8, F.A.C.) by the governing boards of the water management districts. Rule adoption involves public workshops, review by the Florida Department of Environmental Protection, and publication in the Florida Administrative Register. MFLs are to be reviewed periodically and revised as necessary under Florida law (Subsection 373.0421(3), F.S.). MFLs apply to decisions affecting permit applications, declarations of water shortages and assessments of water supply sources. Computer water budget models for surface waters and groundwater are used to evaluate the effects of existing and/or proposed consumptive uses and the likelihood they might cause significant harm. The district’s Governing Board is required to develop recovery or prevention strategies in those cases where a water body or watercourse currently does not or is anticipated to not meet an established MFL. In order for an applicant to obtain a consumptive use permit, the consumptive use must be in accordance with the MFL and any approved prevention and recovery strategies. MFLs reevaluation is an ongoing process. The district intends to reevaluate most MFLs at some point in order to apply new data and techniques that have been developed since the original MFL was set. The criteria used for setting MFLs for different types of lakes has evolved as the district’s understanding of the hydrologic characteristics of different types of lakes has improved. Current models are more sophisticated, and analytical tools and data continue to improve. If methodologies have changed or if the adopted MFLs are based on outdated criteria and indicators, staff will determine when a reevaluation is necessary and prioritize as needed. What are prevention and recovery strategies? Prevention and recovery strategies are developed and implemented to ensure that MFLs will not be violated by future water withdrawals (prevention), or will be recovered to meet their MFLs (recovery) if a violation caused by withdrawals has already occurred. Prevention and recovery strategies call for water withdrawals to be maintained at or below sustainable limits, or for impacts from water withdrawals to be mitigated through water supply development projects — such as reclaimed water, aquifer recharge and water supply projects — and conservation and regulatory measures. These strategies are designed to ensure that fundamental characteristics of a water body are maintained over time, to achieve equity among water users, to provide users with greater certainty regarding allocations, and to ensure that MFLs are met. When a water body’s water levels fall below the MFLs, is it a violation of MFLs? Not necessarily. It is expected that water stages will vary above, among and below the elevation components of MFLs. Importantly, MFLs have a water level component, a duration component at that level, and a return interval component for the defined event (i.e., defined by the stage and duration components). An MFL is in violation if it is too low, for too long, too often, or does not get high enough for long enough, often enough. That is, MFLs compliance is a factor of long-term hydrologic statistics, not a point-in-time water level.